There was a sense of inevitability about Fernando Alonso's announcement on Tuesday that he is to leave Formula One at the end of the season. McLaren driver Alonso had been heavily linked with a move to IndyCar, a switch that would help him complete motorsport's famous triple crown of the Monaco Grand Prix, Le Mans 24 Hours and Indy 500. The Spaniard, who has grown frustrated at his team's inability to deliver a competitive car in recent F1 seasons, is one of the most popular and naturally gifted drivers on the grid - the only surprise throughout his career is that he has only secured two world titles. Below, we look at how Alonso's numbers stack up against the best in F1 history. Alonso has chalked up an impressive 32 wins during his 17 years in the sport, but is some way below Michael Schumacher's best of 91. 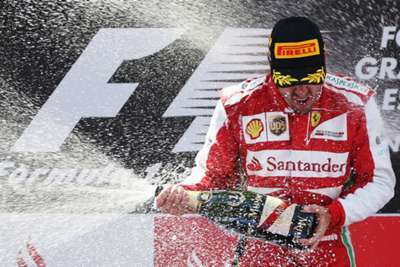 On 22 occasions, the former Ferrari driver has started a race from the head of the grid. Former McLaren team-mate Lewis Hamilton leads the way in terms of securing the most pole positions, a statistic he looks certain to keep extending. Alonso is just three shy of reaching a century of career podium finishes. Schumacher, again, tops this list, with current drivers dominating the top of the list. It is no surprise that Schumacher continues to lead the way in terms of titles. Hamilton and Sebastian Vettel appear the most likely to challenge his tally out of the active drivers. Alonso's successes came in 2005 and 2006, while he has finished second in the standings three times.